Working within policy management or compliance teams in large or complex organisations can bring with it many challenges. Not least of which is making sure your business keeps pace with the ever changing policy, regulation and compliance landscape. Take any one of the vast array of regulations out there – for example the latest Anti-Money laundering policy – and you can say with a high degree of certainty that Governments and governing bodies will frequently review policies which means the rules can change at any time. At the simplest level, there are a number of key ‘asks’ that these policies require an organisation to implement – in order to achieve successful accreditations, or perhaps keep receiving incentive payments or licences for business. So It’s important (both legally and competitively) to keep up to date with the rules, policies and regulations and even more so in many cases to make sure your employees are aware of this Policy Change. To keep pace with Policy Change and regulation, an organisation can choose to take a number of approaches. Firstly, they could gather the latest policies together and use email, group mailboxes or postings on company intranets to disperse the message to those who need to read it. The chances are however, that in doing this, they will feel the pain (often acutely). Not only of changing the guidelines or policies their staff must adhere to but in actually implementing the change. Not only do vast numbers of emails with complex messages turn people off, but they do not allow the organisation to understand the success of any new policy implementation. Training systems can be used. Again, the challenge faced is to engage the audience easily and allow the organisation to measure successful implementation. A typical problem here is that the user experience will take the colleague from an email, to a training login, to a catalogue of training, to a course and finally to a quiz. Often, then back again to fill in central spreadsheet to show completion! While training is often made mandatory within organisations to overcome this pain, the user experience will still be poor and the difficulty faced in tracking and sharing data about task completion is unnecessarily high. So its clear that the problem isn’t the message being delivered (the new policy) it is the method of delivery. 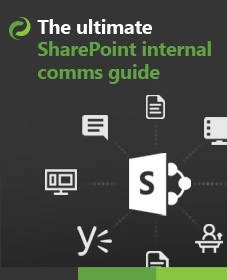 Instead of suffering a lack of control and disengaging your staff, if you have SharePoint, there is a SharePoint Policy Management short-cut! Why use SharePoint for Policy ManagEment? 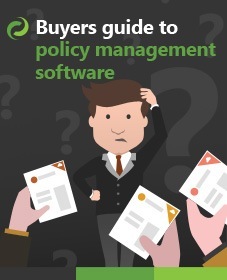 If you use SharePoint in your organization and would like to know why it'd be a great choice to manage your policies then take a look at 'Why policy management in SharePoint'. With DocRead (that works with SharePoint 2010 and 2013), you can carry out your policy management from a central team or location within your SharePoint estate. When a government for example releases a new policy, you simply make sure that central location is updated. Then you target the right people using the technology you already have in place (SharePoint audiences or AD groups). The process is simple. You choose the right groups of people (just as you would in an email campaign), attach DocRead to the policy or procedure, set the time-frame for achieving compliance or at least confirming the document has been understood and click send. That’s it! Once you have followed that simple DocRead workflow, your company policy or compliance officer can simply monitor the progress of the policy through your company by using embedded MI dashboards. He/She can see who has read and confirmed understanding of the document, which departments are regularly ignoring the requirement to read the updates and which are always on time. Using DocRead, your organisation can not only stay on top of the changes to policy or regulation but also look to improve the way in which the messages are received. The MI might tell you that Power-point documents are always better received than word documents for example, or videos give you a 99% success rate against a static document which hits 75% readership most of the time. In short, instead of losing the message or updating in the delivery method, DocRead can help you elevate the message by telling you what works and what doesn’t work within your organisation and give you real time information your own completion of the policy refresh activity. We hope this post shares some of the benefits of using the shortcut of DocRead in your SharePoint Policy Management to keep on top of changes without the associated pain.